Material: Cloth. Size: Approx. 8 * 9.5 * 1cm/ 3.1 * 3.7 * 0.4 inch (L*W*H). Light weight, Comfortable heart bun maker, Come with elastic band bobby pins. Easy to use, Add volume fullness to your hairstyle. Perfect for weddings, proms, party, ballet dance, dance recital, valentines daily activities. This item is manufactured with premium material for durable and long-lasting use. It’s a great tool for creating the perfect heart bun by yourself. It’s also light weight for portable use. 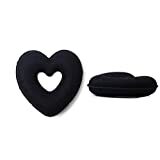 This comfortable heart bun maker come with elastic band andamp; bobby pins which is easy to use. It’ll add volume andamp; fullness to your hairstyle. – Size: Approx. 8 * 9.5 * 1cm/ 3.1 * 3.7 * 0.4 inch (L*W*H). – Light weight, Comfortable heart bun maker, Come with elastic band andamp; bobby pins. – Easy to use, Add volume andamp; fullness to your hairstyle.